Register in store or with pre-payment below. 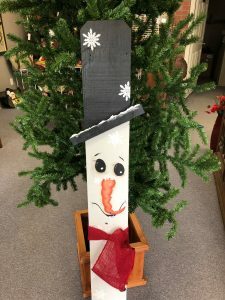 Snowmen are always a holiday decorating favorite and this sassy snowman will carry you though the winter season. Tall enough to sit on your porch or by a fireplace. Light enough to hang on a wall. No painting experience needed and we provide all the supplies you need.